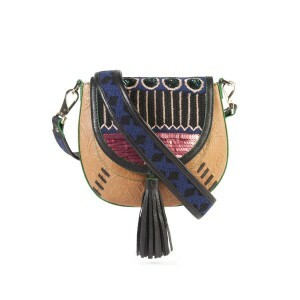 Small embossed textured bag, zip adorned with a large tassel, embroidered front with a two-tone pattern and with iridescent sequins. Entirely made by hand in chrome-free, natural dyed leather. The cross-body shoulder strap is detachable. The bag closes with a zip on top. It is the perfect size to be combined with a more muted look.